The common risk factors for bladder cancer predispose incident cases to men and women with fewer socioeconomic resources than patients with other common cancers. Despite its prevalence—bladder cancer is the fourth most common cancer in US men—advocacy for bladder cancer is nascent and bladder cancer remains underfunded nationally relative to other common cancers. Yet bladder cancer, per capita, is the costliest cancer to treat in the US. 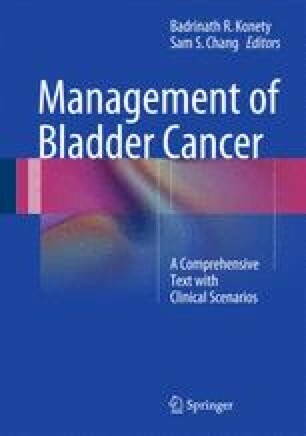 Given that the US health care system exhibits marked variations in the delivery and quality of health care services provided, bladder cancer should be a target for broad quality improvement efforts. Nationally, payers are implementing payment changes that will incentivize high value care where high quality care is delivered at lower cost. Herein, we discuss health care disparities in bladder cancer care, the quality of bladder cancer care delivered nationally, and opportunities for quality improvement to optimize the health outcomes of bladder cancer survivors. Todd SR, Sommers BD. Overview of the uninsured in the United States: a summary of the 2012 Current Population Survey Report. Washington, DC: U.S. Department of Health and Human Services; 2012. Available from: http://aspe.hhs.gov/health/reports/2012/UninsuredInTheUS/ib.shtml. Accessed 4 Dec 2012. FACT SHEET: Blue Distinction®. 2012. Available from: http://www.bcbs.com/why-bcbs/blue-distinction/blue-distinction-fact-sheet.pdf. Accessed Oct 15 2012. Physician Quality Reporting System. Baltimore, MD: Centers for Medicare & Medicaid Services; 2012. Available from: http://www.cms.gov/Medicare/Quality-Initiatives-Patient-Assessment-Instruments/PQRS/index.html?redirect=/PQRS. Accessed 22 Oct 2012. PQRS Toolkit. Linthicum, MD: American Urological Association; 2012. Available from: http://www.auanet.org/content/health-policy/regulation-and-reimbursement/payor-information/pqrs-toolkit.cfm. Accessed Jun 2013. Overview list—how many smokefree laws? Berkeley, CA: American Nonsmokers’ Rights Foundation; 2013. Available from: http://www.no-smoke.org/pdf/mediaordlist.pdf. Accessed Jun 2013.